Namadgi National Park is a protected area in the south-west of the Australian Capital Territory, bordering Kosciuszko National Park in New South Wales. It lies approximately 40 kilometres (25 mi) southwest of Canberra, and makes up approximately 46% of the ACT's land area. The national park protects part of the northern end of the Australian Alps with its spectacular granite mountains. Its habitat ranges from grassy plains over snow gum forests to alpine meadows. The fauna is also varied: eastern grey kangaroos, wallabies, wombats, magpies, rosellas and ravens are commonly seen. The water catchment area of the park supplies approximately 85% of Canberra's water. In this sub-alpine region the weather ranges from cold winter nights to warm summer days, and it can change very quickly. Snow normally falls on the Bimberi and Brindabella Ranges during winter, and is not uncommon throughout most of the park. The highest mountain is Bimberi Peak at 1,911 metres (6,270 ft) which is the highest peak in the Australian Capital Territory. The national park is classified as an IUCN Category II protected area. Namadgi is a local Aboriginal name for the mountains situated to the southwest of Canberra. Aboriginal presence in the area has been dated to at least 21,000 years. 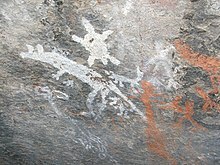 There are numerous Aboriginal sites in the national park including paintings at Yankee Hat dating from at least 800 years ago. The area is one of cultural significance to indigenous Australian people of the Australian Alps region, and in particular the Nyamudy/Namadgi tribe who inhabited the ACT region before European settlers arrived, and the national park's management plan is exercised with their consultation. In April 2001 representatives of the Ngambri communities entered into an agreement with the ACT government which recognised their traditional association with the national park's lands and their role and duty to their ancestors and descendants as custodians of the area, and established a system of cooperative management. The area has a European history dating back to the 1830s when settlers moved into the area and cleared the valleys for farming. The mountains and ridges remain forested. Namadgi National Park was created in 1984. The Visitor Centre is located 2 km south of Tharwa on the Boboyan-Naas Road. The Namadgi National Park Draft Management Plan (September 2005) downplayed the future development of skiing as a sport in the Park, noting that no facilities existed for alpine or downhill skiing within Namadgi, despite a history of downhill skiing associated with the Canberra Alpine Ski Club and the Mt Franklin Chalet (destroyed in the 2003 bushfires). The report predicted that it would be "unlikely that Namadgi will be suitable for this activity in the future as climate change is causing conditions to become less favourable." However, since the report was written, limited downhill ski facilities have returned at nearby Corin Forest, and cross country skiing takes place within the Park at various locations when conditions allow. The Mount Franklin chalet was constructed at Mount Franklin in 1938 to service the Canberra Alpine Club. Ski runs were cleared and ski tows were improvised. The Club also cleared runs elsewhere, completing a new ski run and jump on nearby Mount Ginini in 1951 - then judged to be the superior slope. Built on leased land, the Mount Franklin Chalet reverted to the Government when Namadgi National Park was created in 1984 and later operated as a museum before being destroyed in the 2003 bushfires. A new shelter designed and built by University of Adelaide students opened in 2008. Today, cross country skiing is possible in the area, when conditions allow. On 7 November 2008, the national park was one of eleven protected areas added to the Australian National Heritage List under the title of the Australian Alps National Parks and Reserves. Panoramic view from the top of Mount Ginini, Namadgi National Park. ^ "Namadgi National Park". Environment.act.gov.au. 23 April 2018. Retrieved 16 August 2018. ^ "Namadgi National Park". Australian Alps National Parks. Commonwealth of Australia. Retrieved 29 January 2010. ^ "Terrestrial Protected Areas in ACT (2014) (see 'DETAIL' tab)". CAPAD 2014. Australian Government - Department of the Environment. 2014. Retrieved 15 September 2015. ^ Parks and Conservation Service. "Namadgi National Park Map and Guide" (PDF). Retrieved 25 February 2015. ^ "Namadgi National Park Revised Draft Plan of Management" (PDF). Department of Territory and Municipal Services. 2007. Archived from the original (PDF) on 3 August 2008. Retrieved 30 January 2010. ^ "Australian Alps National Parks - Parks in the alps - Bimberi Nature Reserve". Australianalps.environment.gov.au. Retrieved 16 August 2018. ^ "What's On". 25 January 2014. Archived from the original on 25 January 2014. Retrieved 16 August 2018. ^ "Australian Alps National Parks - Parks in the alps - Namadgi National Park". Australianalps.environment.gov.au. Retrieved 16 August 2018. ^ "Australian Alps National Parks information". Department of the Environment, Water, Heritage and the Arts. Retrieved 10 June 2010. ^ "INCLUSION OF A PLACE IN THE NATIONAL HERITAGE LIST" (PDF). Commonwealth of Australia. Retrieved 30 June 2015. This page was last edited on 29 September 2018, at 10:35 (UTC).